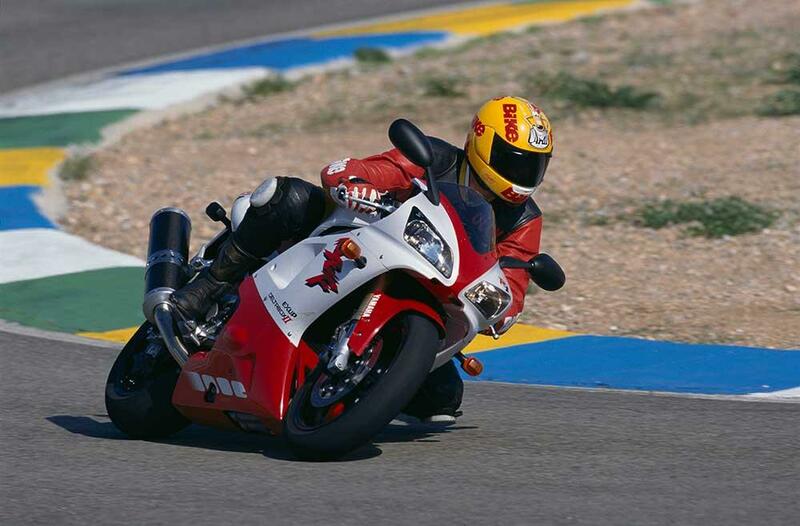 In January 1998 Bike magazine's rode tester Olly Duke rode the original R1 at the bikes launch in Cartagena. It's fair to say he liked it. He liked it a lot. ESSS! Yes, yess, yeeesss! Omigod, yes-yes-yeeesss! More-more-more! Jesus Christ, oh, yessss! Aaagghh!!! I’m on the motorway, tucked behind the screen, throttle wide open, watching the revs build up in top gear, the speedo climbing towards some hyperspeed crescendo, cars flashing by like they’re stood still, doing 170mph – and still there’s bags of power and speed to come. I’m not frightened, because the R1 is so damned stable, but my brain’s having trouble keeping up. The adrenalin’s pulsating through me and I want more, more, more. It’s not often that I have the chance to go completely ballistic, but Yamaha assured me that the local cops are turning a blind eye. So I wring the throttle at every opportunity, getting a massive fix every time I do so. Yup, I’m really worked up, because I’ve just spent a day at the incredibly twisty Cartagena circuit with the R1. This is the first day of the bike’s Spanish launch and I have to say the R1 is everything it’s been cracked up to be. And better. You may think it’s daft testing one of the world’s quickest bikes at a technical 2.1-mile circuit with 14 corners and a very short start-finish straight, but Yamaha is so confident of the R1’s ability it deliberately chose this track to show off its handling. Dead right too. This 150bhp rocket steers and corners better than any 600 or 750. It’s together, more planted, more confidence inspiring. You can push the front end hard, you can drop it onto your slider with ease, you can get on the gas dead early. The R1 has the Honda RC45 and Ducati 916 well and truly beat. This is the first time in five years that anyone has challenged the might of the FireBlade, and it’s been done in superlative style. The R1’s handling, engine and design gel together to make it the machine of the year. But first let me tell you about Cartagena, because everyone rode away in the evening in awe of the Yamaha. At the end of the start-finish straight you broke hard for a double, blind right hander, where you push the front end. You’d expect the machine to run wide, but the R1 turns in quick and tracks through the corners with complete precision. It behaves like a well-sorted 600 through the next sharp left and the left-right flick that follows. From there on the all-new Deltabox II chassis and superb suspension cope with an array of bends that would test even the best racer to the limit. There’s no rest for the rider either. You’re either on the brakes, flicking the bike on its side, or piling on the power for the next bend. I may have been losing my cool, but the R1 stayed pretty composed throughout. I say pretty, because the Yamaha wears Metzeler’s new MEZ3 tyres, which is the limitation on the machine’s ability. While the front never budged, the rear broke traction predictably, but far too early. I wound up the rebound and compression damping a couple of turns, which helped increase grip. The suspension is excellent and adjusting the 41mm upside down forks and rising-rate monoshock makes a lot of difference to the ride – not always the case with sports bikes. The R1’s front brakes are superb, too. They don’t have the infinite feel of the Thunderaces, but they’re just as powerful and never fade. The lever is five-position adjustable, the four-piston callipers have been lightened to reduce unsprung weight, and smaller, dual 298mm discs reduce the gyroscopic force on the wheels, so making the bike easier to turn. Yamaha has fitted thin-walled, three-spoke wheels that also lessen the unsprung weight and make for fast steering. If you’re in awe of the chassis, listen to what I’ve got to say about the engine. It’s an absolute stormer. You might think Yamaha sacrificed mid-right grunt to achieve it’s claimed 150bhp, but not a bit of it. This silky smooth, four cylinder mill pulls from 1000rpm in top gear and then provides you with seamless creamy power all the way to the 11.750 red line. It’s so smooth and tractable and easy to use on the one hand, but crack the throttle open and the machine goes crazy. I had a couple of tasty slappers accelerating onto the start-finish straight when the front wheel went skyward. There’s such a broad range of power. I only had to make eight gear changes for each lap of the circuit, for the most part just shifting between second and third. The engine pulls strongly from 5000rpm and really comes to life at 7000rpm. The four 40mm carbs provide immediate throttle response throughout the rev range and power kicked in so hard coming out of one corner that I thought someone had booted me up the arse! Slick gear changes are a must for track work, and the R1 has one of the best boxes in the business. The rations are well-spaced and the merest snick of the pedal is enough to hook up; if anything, going up a gear is smoothest without clutching. However, as we all know, a bike that performs on the track can be a pig on the road. The roads around Alicante, where the R1’s launch took place, are mostly mountainous and twisty, while the surface ranges from smooth and grippy to bumpy and gritty. But the R1 spat out the lot in complete contempt. It flicks through esses, corners with flair, and gobbles up the straight bits like they’re hardly there. There’s no way a 600 or 750 comes anywhere near to equalling the Yamaha’s agility and the suspension was as comfortable as it was controlled. The immense power on tap is even more noticeable on the road. There’s so much grunt that much of the time I was fooled into thinking I was in a lower gear than I was. The R1 is one of the few machines where you hardly ever need to go through the box, but when you do you reach crazy speeds in a flash. The motor is remarkably smooth as well. It pulls smoothly from as little as 1000rpm to top and then transforms into pure silk. And the clutch, which has long been a weak point on Yamaha sports bikes (it judders with quick take-offs and burns out quickly with abuse), seems to have been sorted. If this sounds intimidating, it shouldn’t. The R1 is an easy machine to ride – as long as you’re taking it easy. This Jekyll and Hyde bike has a user-friendly engine with an utterly stable chassis and slick controls. However, at heart it isn’t a grey-suited bureaucrat; the front snaps up under sudden acceleration, the combination of huge power and minimal weight has to be respected because it will spin the rear wheel easily, and acceleration is eye-popping. Naturally, the R1 isn’t an armchair either. Yamaha officials at the launch laughed at the pillion seat (you won’t if you ever sit on it) and they were at pains to explain that the riding position is designed to push your bodyweight forward and so enhance handling. Having said that, I’m 6ft 2in and was pretty content. It may not be as comfortable as the ‘Blade of ZX 98, but you feel part of the bike. You lean forward, over the clocks 916 style, so you forget about the machine’s mass: there’s just you and a tiny bit of cockpit in view. The high tank is supportive while in the racing crouch and the bars are deliberately forward and low, causing some arm ache at slow speed. And I did have to stretch my legs after an hour on the saddle. But goddamn it, when I go out on my R1 I’m looking for hard-core fun. I don’t want to mince with touring dullards. None of this would mean much if the R1 looked like a pile of poohl However, this Yamaha is totally refreshing. It breaks the mould of the plastic crotch rocket and is one of the best designed bikes around. In my opinion it rivals Ducati’s 916 and makes the new Honda FireBlade and Kawasaki ZX—98 look boring. Those menacing headlights, the angular fairing and 916-style screen, the upswept and lightweight tall unit, those discrete tail lights all give the R1 an aggressive, futuristic feel. Even better, the build quality is very good. For example, the footrest hangers are polished - on my CBR600 they’re plain old cast ‘n’ left. The paint is good quality, the top yoke a work of minimalist art, the digital speedo offsets the racy rev counter, the polished and curvy chassis and hugely braced aluminium swing arm look a million dollars. You also have a choice of two colours: deep, metallic blue and traditional red and white. When the R1 comes here in mid-January it will compete with the £9250 FireBlade and ZX-9R, and Yamaha expects to outsell both. I’ll back them. In this three-horse race, it’s going to be the R1 that makes the running.